Central Park Zoo tickets can be purchased easily before you depart, saving you time and money. Central Park Zoo is the most famous zoo in New York. 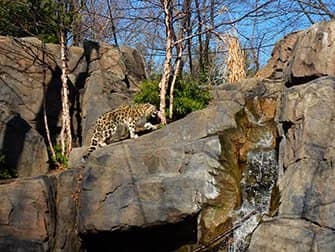 The zoo is not very big, but definitely has enough to offer for a nice morning or afternoon, especially if you are in New York with children. Central Park Zoo is comprised of a zoo, a petting zoo and a 4D film theatre. It is located in the south-eastern most corner of Central Park. The entrance is situated in the park, in the vicinity of 64th Street. 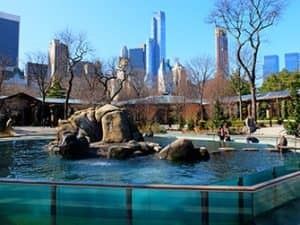 Central Park Zoo has a variety of exotic animals, including snow leopards, grizzly bears, red pandas, snow monkeys and sea lions. The park is also home to a number of different breeds of penguin including the king penguin. The daily feedings of the penguins and sea lions are accessible to the public and are very nice to see! 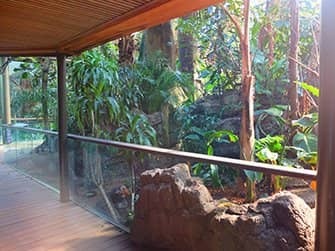 Don’t forget to take a walk through the replica tropical rainforest. Various exotic birds live here, but also lemurs, bats and snakes. Alongside seeing all the animals, you can also go to the zoo to see a 4D film. This is a 3D film with extra sensory effects, like wind and water, a whole experience! (but maybe a little scary for the very young). The largest section of the zoo is accessible for prams, buggies and wheelchairs. Just past the main entrance to the zoo is a petting zoo, Tisch Children’s Zoo. The entrance fee is included in the tickets for Central Park Zoo. Here children can stroke the animals and, for a small donation, feed them. You won’t find any leopards or grizzly bears here, but smaller animals like sheep, goats and pigs. There is also a very special attraction here: the only cow in Manhattan!